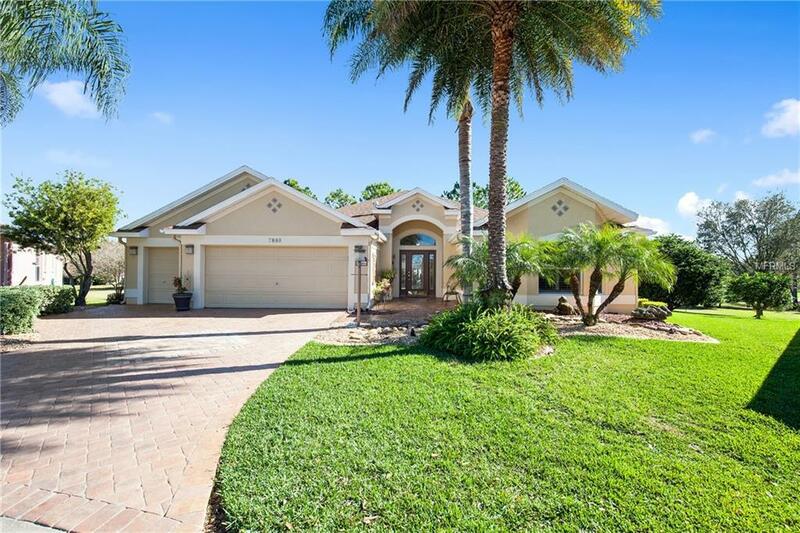 ***JUST REDUCED*** - Beautiful, expanded and elevated Lantana model home offering upscale living in popular Calumet Grove overlooking Torri Pine Golf Course. Two car garage plus golf cart garage. Three bedrooms with two full baths featuring upgrades throughout. No carpeting - ceramic tile in social areas and laminate flooring in the bedrooms. Expanded master bedroom with an expanded master closet that is beautifully customized to utilize every space to the finest taste. Bedroom Two is currently being used as a media room but closet remains for bedroom use. A beautiful kitchen with solid wood cabinets, granite counter tops, marble back splash and under cabinet lighting. Tile was added under the snack bar to avoid kick stains. Pull outs in all the cabinets including the pantry. Built-in oven, glass cook top and wine refrigerator. Crown molding. The utility room was expanded to include a built-in desk. Screened openings fro the two car garage and the entry to the utility room. All windows are double pane and solar tubes are used for energy efficiency. Gas is connected to the tankless water heater, the outdoor grill and home heating. The covered and screened lanai with the eastern exposure was expanded to include the outdoor kitchen with birdcage screening. Dine alfresco while enjoying the views of the golf course from the elevated position. Warranty for appliances through Broward Factory Services until 12/2019. New roof-2014 and A/C-2018. Come see and you'll want to stay.